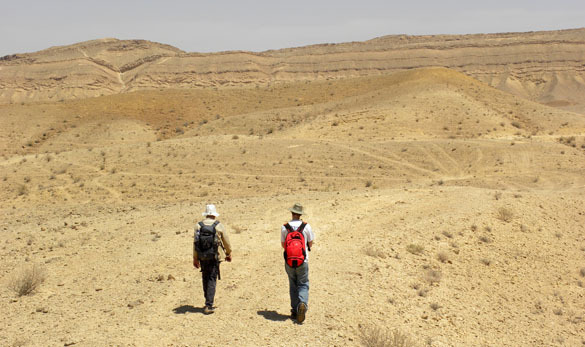 MITZPE RAMON, ISRAEL–Today Will Cary, Yoav Avni (our friend from the Geological Survey of Israel) and I worked in the northern end of Makhtesh Gadol (“the large crater”). 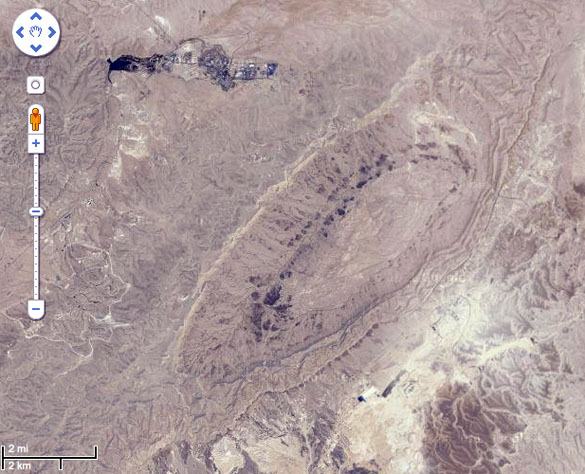 This geomorphic feature looks a bit like an oblong impact crater, but it is actually a kind of breached anticline known as a makhtesh. Makhtesh Gadol from Google Maps. We are interested in the Matmor Formation, a series of Middle Jurassic marls and limestones in the center of the structure. Our special interest is a fossiliferous unit in the Matmor Formation that is found throughout the exposure. It is very rich in crinoids, echinoids, corals and sponges, with a few brachiopods, ammonites and bivalves as well. We want to understand the distribution of this unit and its fossils. 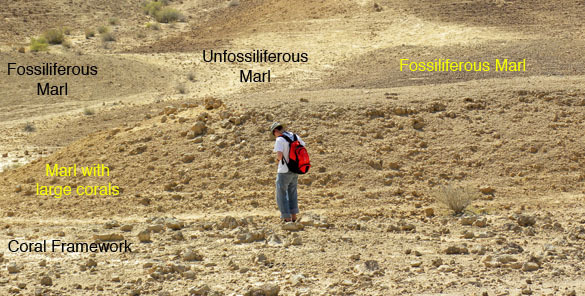 Yoav Avni and Will Cary marching through the Matmor Formation. If we saw this formation in only two dimensions, as in a typical roadcut, it would be easy to interpret. However, we have it exposed in 3-D because it is heavily dissected by small wadis. More data this way, and far more complications. We learned today that there are distinct facies (rock types characterized by fossils and/or sediments indicating a particular depositional environment) found in very close relationships. The rock units are patchy and the fossils patchy within the lithological patchiness. The number of variables used to predict fossil occurrences is now very large! All these facies are laterally equivalent in a very small space. One of the many scleractinian corals in the Matmor Formation. 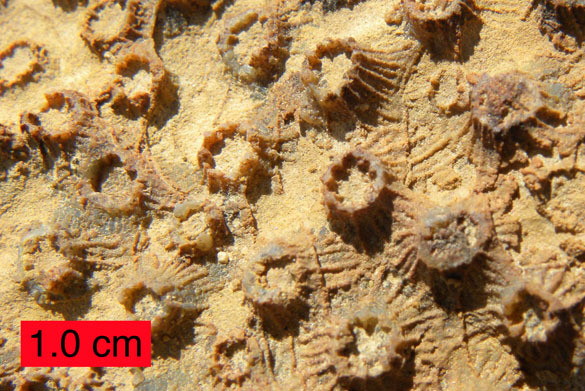 These corals were originally aragonitic and are now replaced by calcite. The replacement process was unusually fine-grained here.